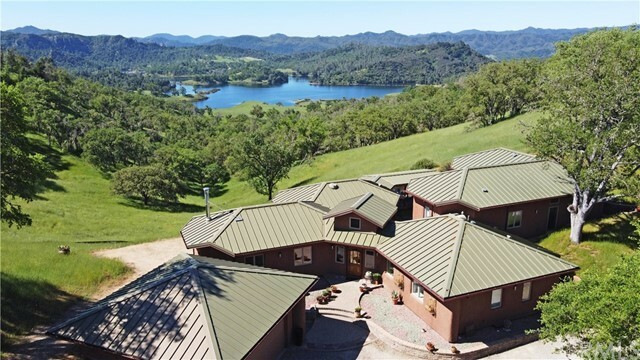 84+/- beautiful acres with an architect-designed, eco-friendly lake view home. The custom house blends high- and low-tech features into an elegant, efficient, and extremely comfortable residence. The home backs to land surrounding public Santa Margarita Lake with its miles of trails for scenic recreation. The solid wood front door invites you through the foyer with its courtyard view into the living room with breath-taking panorama of the lake. The polished concrete floors with walnut baseboards include radiant-floor heating and act as thermal mass for passive solar heat storage in winter. The kitchen has quartz countertops, maple and walnut cabinets with easy-close hardware, stainless steel appliances, 5-burner stove with high-end hood, center island with sink, walk-in pantry, cutting boards, and more. The master bath has quartz counters, tub, and walk-in shower with two shower heads. There is a laundry room with a deep sink, equipment room, and mud room. The entire home and barn have whole-house reverse osmosis filtered water. The 40â x 40â shop has an RV door, car door, bathroom, free Wi-Fi, upstairs storage area, and outside veranda. A large flat area of land provides room for a future arena, vineyard, orchard, barn, or other. The property has two wells, two water tanks, two septic systems, three electric meters, backup generator, and three propane tanks. Everything you need for luxurious country living!